Star anise (Illicium verum and Illicium anisatum) is widely used worldwide as a digestive aid, including its use in babies for colic, which is an especially popular practice in South America. However, Illicium species contain sesquiterpene lactones that have been associated with neurotoxicity. Japanese star anise (I. anisatum), also known as shikimi and a very common adulterant on the true star anise market, contains higher concentration of these lactones and has been associated with many toxic events in children, most notably, convulsions that have been reported since the late 1800s. There are subtle morphological and sensory differences between the fruits, but admixtures are very difficult to discern, requiring more sensitive chromatographic methods for the detection of shikimic acid. The AHP monograph provides a detailed review of the toxicity, history of adulteration, and botanical, morphological, microscopic, organoleptic, and chemical differences between the two species. 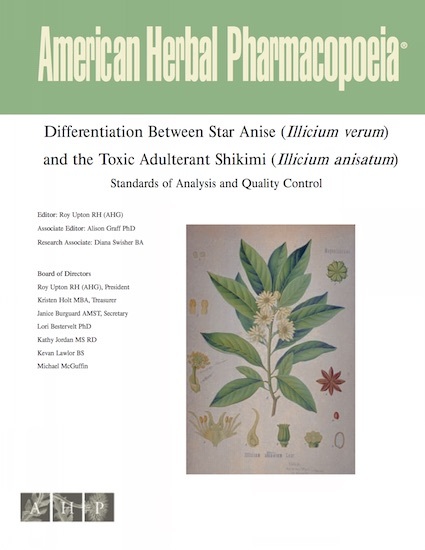 Analytical methods for differentiating between the species include colorimetric assays used by early pharmacognosists (in a simple color reaction test shikimi gives a yellow color and true star anise a pink to red color), HPTLC, and an HPLC-MS method that is routinely used in the European Union to prevent Illicium adulteration. As with all AHP monographs, the Illicium document provides detailed photographic images of the true and adulterating species, along with clear images of the colorimetric assay and HPTLC chromatograms. Perhaps most importantly, the AHP Illicium monograph provides commentary on the strengths and limitations of the various testing methodologies for differentiating between the species.